It is 1910, and Llandudno, the most fashionable seaside resort in Wales, has a problem: the Town Band is not providing entertainment to the standard expected by its discerning visitors. 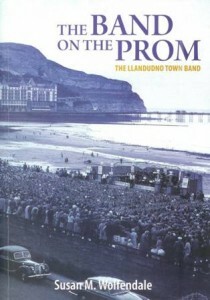 This is the story of how the St Tudno Silver Band came to an arrangement with the Llandudno Urban District Council; of its extraordinary bandmasters, who took on the challenge of providing music whenever the town required it; of the phenomenal success of the nightly shows on the promenade bandstand, that brought visitors flocking back to the resort year after year. It is also the story of the working men – joiners, plumbers, engineers – who dedicated decades of their leisure time to playing the iconic ‘tiddly-om-pom-pom’ on the promenade. The history of the Llandudno Town Band’s first 100 years is told through unprecedented access to the Band’s archives and reveals the previously hidden story of the amateur musicians who became the very public face of Llandudno.